Cary Fukunaga, the young director behind the success of the visionary True Detective, is zeroing in on an actor to star in his newest project, The Alienist, based on Caleb Carr’s bestseller about a serial killer set in the late 1890’s NYC. * It’s not definite but Garrett Hedlund—Pan, Unbroken and Ang Lee’s Billy Lynn’s Long Halftime Adventure due out November 11th—would star in the lead role. The project has been written by Drive scripter Hossein Amini, who also wrote the screenplay for the adaptation of John LeCarré’s Our Kind of Traitor which I happen to be reading right now. The Alienist is contracted to air on TNT, and as a series to watch week after week or even binge, has several things going for it: We all love the gilded age time period. The notion of seeing Theodore Roosevelt as a young police commissioner is intriguing. There’s apparently a decent role for a woman in Sara Howard, a brave and determined secretary, actively involved in the search. And of course, the pair of NY Times reporter and his friend, the psychologist Dr. Laszlo Kreizler, the actual ‘alienist,’ essentially the first criminal profiler, and presumably the role Hedlund would play. The year is 1896, the place, New York City. On a cold March night New York Times reporter John Schuyler Moore is summoned to the East River by his friend and former Harvard classmate Dr. Laszlo Kreizler, a psychologist, or "alienist." On the unfinished Williamsburg Bridge, they view the horribly mutilated body of an adolescent boy, a prostitute from one of Manhattan's infamous brothels. 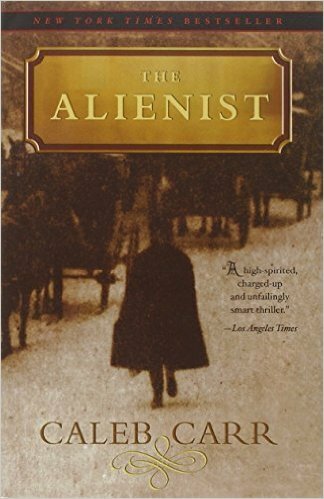 Fast-paced and gripping, infused with a historian's exactitude, The Alienist conjures up the Gilded Age and its untarnished underside: verminous tenements and opulent mansions, corrupt cops and flamboyant gangsters, shining opera houses and seamy gin mills. Here is a New York during an age when questioning society's belief that all killers are born, not made, could have unexpected and mortal consequences. If done well, and with the right casting for the remaining key players, this could prove as addictive as True Detective. There’s a second book to Carr’s series, so expect a second season on your telly too.